I’m smack in the middle of a personal challenge to read at least one book every week. The erudition section of this blog is my attempt to chronicle my challenge and galvanize a lifetime of curiosity and learning. If you have read any of these books before, or happen to pick one up and find it interesting, I’d love to hear your thoughts too. Remember Tripod.com? You know, back in the dinosaur age of the internets, when only the über-smart and curious intellectuals (read: nerds) were the ones who ventured into the land of dial-up? Yeah, I was there, and I’m pretty sure I had a “homepage” on Tripod. Well the guy behind Tripod, it turns out, was a kid—Bo Peabody. After nursing Tripod as a pet project through college, he hired hippie programmers to wrangle the code that he himself didn’t know how to write. Supervised by his economics professor, Tripod.com began as a how-to site for-and-by college students. As soon as he unleashed the code monkeys, however, they transformed it into a publishing platform, allowing anyone with an Internet connection to create their own personal homepage. Fast forward six years. Peabody sells his company to Lycos for a reported $58 million in stock. Rock on. 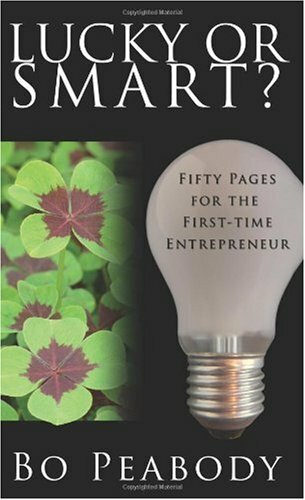 This entry was posted in Reading Notes and tagged bo peabody, books, business, entrepreneurship, erudition, luck, lucky, lucky or smart, smart on 2011.08.16 by Ben Sima.